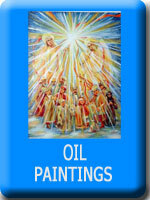 Reverse painting on glass, oil on canvas, cards, and ornaments, all painted and created by Ukrainian artist Jaroslav Adamovych from Lviv, Ukraine. These are all original works in his unique style. 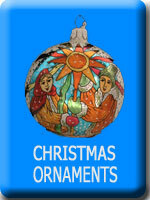 A few of Adamovych's works have been chosen for the UNA Christmas Card Project. 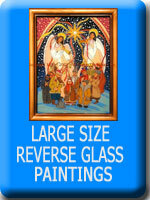 Reverse glass paintings are painted on the back of the glass. 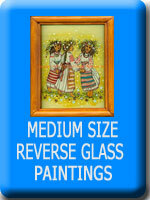 Sizes of each work shown are the dimensions of the glass or canvas, and do not include the width of the frame. 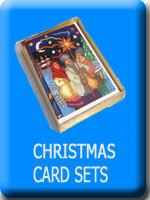 Frames vary and are shown in each photo. 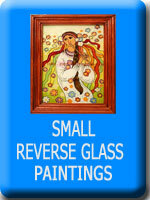 The miniature glass paintings are unframed.